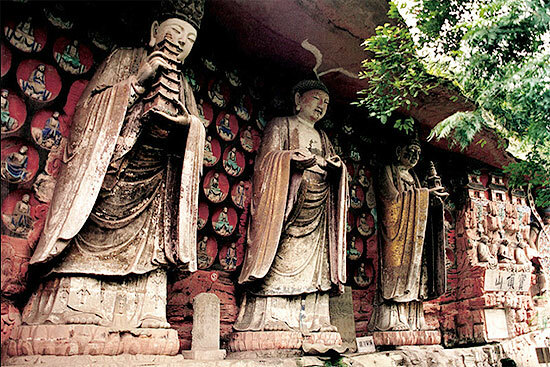 The stone carvings of Dazu are located in Dazu County, 163 kilometers west of Chongqing City Proper. The carvings started in 892 and concluded by the end of the Southern Song Dynasty (1127-1279). 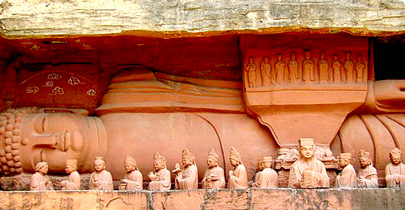 They are excellent works of stone carving produced during the later period of grotto arts in China. More than 50,000 carved stone figures are scattered over forty places. Those carved out of the rocks at Beishan and Baodingshan are the greatest in number, the largest in scale, the finest in craftsmanship and the richest in content. in 1961 they appeared on the list of the first group of important cultural relics under state protection as promulgated by the State Council. The stone carvings of Dazu, chiefly of Buddhist images, are an art of a religious nature and are praised as the Oriental Carved Bible. There are also, however, separate areas of Confucian and Taoist images, and caves in which the founders of Confucianism, Buddhism and Taoism are placed together. Beside, there are commemorative statues of historical figures.